Many times within the court reporting industry, the assumption for paralegals and attorneys is that all court reporting firms are the same and are created equally. Let’s review that assumption and determine if that really is the case and if all the court reporting firms that are in the industry, provide the same levels of service and work product. It’s a very valid question and certainly makes sense that they would ask. It’s easily answered. Having said that, it also might be an indication that there is an assumption that the court reporting firms they are calling are all created equally and provide the same level of services across the board. If they were all created equally and provided the exact same level of services, then the price is really the only determining factor to consider. Why would an attorney, law firm, paralegal or any client for that matter, want to pay more for the same level of services? The answer is they wouldn’t pay more, provided it was a level playing field. 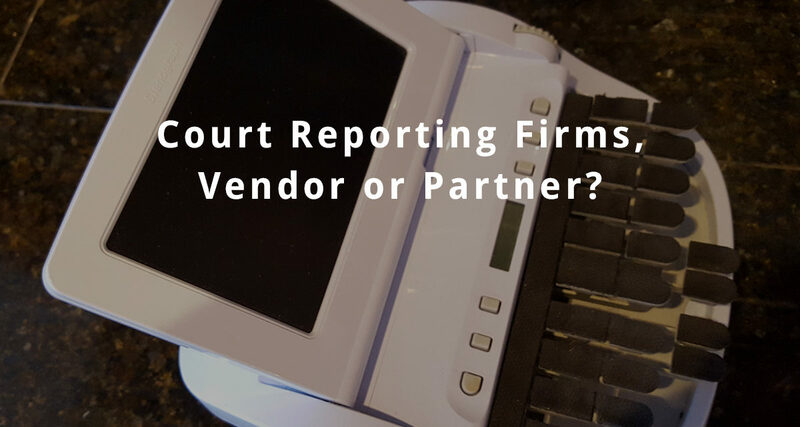 Many times, the court reporting firm is looked at as a vendor, instead of a partnership. As a client, if you save 5 cents a page on a 300 page transcript, you have saved $15.00, congratulations. If you are approaching the court reporting firm as a vendor, the lowest pricing will make a difference to you, however if you have to make 2 calls to ascertain where your transcript is or the transcript is riddled with mistakes, in addition to being 2 days late, that $15.00 you saved doesn’t look like as much of a win anymore. Not to mention, that the same transcript was sent to the wrong attorney’s office. Scheduling the appropriate court reporter, based on the type of services to be performed. Scheduling out of state if necessary. Coordinating all aspects of the process, in state or out. Scheduling conference rooms and/or rescheduling based on cancellations. Making sure the work product is verbatim accurate. Not having to make a call or several calls to find out where the transcript is. In a partnership, the court reporting firm is an asset and resource for the paralegal or attorney, not just a vendor. Assumptions can be problematic in any industry, not just court reporting, but the most effective tool to keep assumptions from taking over is education and communication. This blog is not saying that costs for services isn’t important. It is to all of us, in every industry. But it is also important to determine what services are being provided and the associated standards with those services being provided. If everything were simply a consideration of cost, no one would purchase an Escalade or Mercedes. Everyone would be driving Smart cars!